Style and Pizzazz, are the perfect words to describe our unique handbag holder favors. From Cassiani collections exclusive Murano art deco collection this unique design handmade Venetian like heart glass handbag holders is attached to a high quality metal chain link holder. Each glass heart is made with mixture of purple, gold and silver flakes design colored glass.. These handmade favors are more like a work of art that is sure to leave a lasting impression of your special day with your guests. 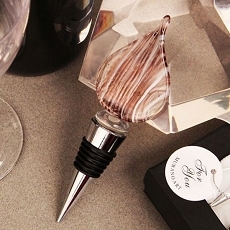 Best of all they are practical and useful, each of these fabulous art deco favors is handmade glass. They are truly unique and no two are exactly alike. They come packaged in high quality two piece elegant white gift box set in a pillow soft satin lining, and stamped with our authentic Murano art deco collection in silver foil. Each favor measures approximately 4" x 2" .